We have mentioned it before: we love muffins and cupcakes. This love for muffins is something newer, that is for sure. Some decades ago we made all varieties tray-baked cakes and took them to parties with family and gatherings with friends. But now we love the reasonable number of 12 muffins. They are quickly prepared, quickly baked, easily packed and the perfect amount for medium-sized families and handful of guests. Besides the practical size there is another plus: you make simple muffins and with a whipped egg white frosting, like we have it on our quark-mandarin-muffins, or a fine butter cream topping, recommended for these chocolate muffins, you can magical turn these simple little cakes into something special and elegant: delicious cupcakes. Little effort, countless possibilities - we love this flexibility. And, one should not forget: they are incredibly yummy. This spongy chocolate muffin recipe even convinced our not-at-all-sweet-tooth, and when nobody is looking he might have a second muffin. This recipe is easiest to make when using two bowls: one to mix all dry ingredients and the second bowl to mix all wet ingredients. In the meantime preheat the oven to 160 degrees and fill the muffin tray with 12 muffin liners. 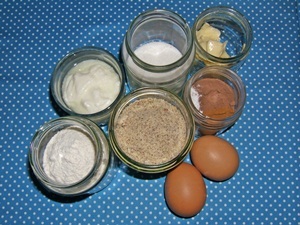 Now mix all the ingredients, fill the muffin batter into a piping bag and equally fill the 12 muffin cases. Leave the muffin tray in the oven for 25 minutes. 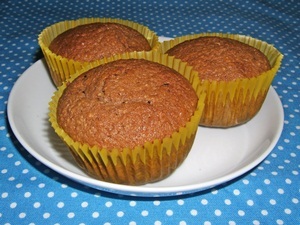 Let the muffins cool and enjoy them with coffee, tea or hot chocolate. 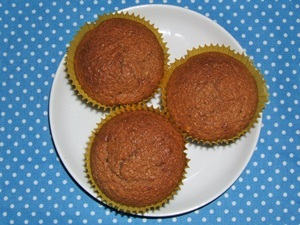 You can prepare these muffins with any type of grounded nuts – typical would be grounded hazelnuts. As some people are allergic against hazlenuts, we prefer to make cakes without them. 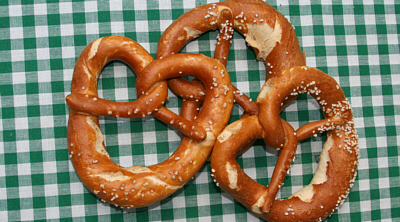 In this recipe we love the almondy taste and the delicate smell that reminds of marzipan. For those who like it a little more sophisticated: these simple muffins can be adorned with a delicious banana butter cream with quark. 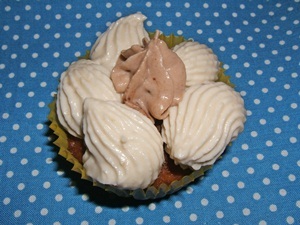 We will soon add the recipe for this light fruity butter cream as frosting.